London - 2nd October 2007 Hitachi Europe Ltd unveils its Ashford Train Depot maintenance facility and six-car Class 395 'bullet train' unit for Southeastern High Speed Services, at an opening ceremony in the presence of the UK Secretary of State for Transport, the Rt Hon Ruth Kelly MP and His Excellency Mr Yoshiji Nogami, Japanese Ambassador. 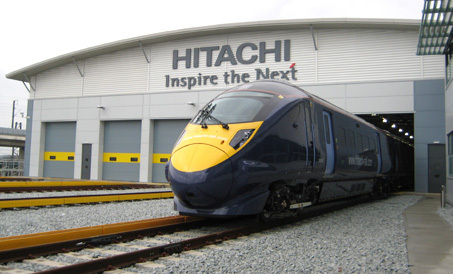 The ceremony, which will take place at 3pm at Ashford Train Maintenance Centre, Ashford, Kent TN23 1EZ, will be hosted by Hitachi and supported by HSBC Rail, Southeastern and the depco consortium. Hitachi's Ashford Train Maintenance Centre will create over a hundred jobs, which will benefit the local economy. The world class maintenance facility includes a five track maintenance shed, incorporating a double road bogie and equipment drop pit and a heavy inspection road. Ashford also includes carriage washing plants, a bio-hazard pit for the safe removal of waste, a 25kV test track and a tandem wheel lathe. Additionally, the depot includes stabling facilities for rolling stock operating on Southeastern mainline services. The depot will house the first Class 395 unit, which has been manufactured to the latest UK and European safety standards in Hitachi's facility in Kasado Japan. A further three trains are currently being assembled and will be delivered over the coming months and will complete a rigorous testing programme on the High Speed 1 line between Ashford and St Pancras and on the Kent network. The remaining 25 Trains will be delivered in 2009. "Today marks a major milestone in the Channel Tunnel Rail Link programme. I'm truly impressed to see this first train in the fleet that will run Britain's fastest domestic train service from 2009. It will transform the experience of commuters, provide a real spur for regeneration, and carry passengers to the Olympics on the Javelin service. "This is all part of the Government's £5.8bn investment in the new High Speed Line, which will revolutionise journey times for domestic passengers as well as those travelling internationally. "This is symbolic of the recovery and regeneration of Britain's railway - backed by sustained funding from both Government and the private sector." A flagship feature of the Southeastern franchise will be the High Speed Services between London St Pancras, Ashford and the Kent coast from December 2009. The service will also include two new stations built at Ebbsfleet and Stratford. A fleet of 29 six-car units will travel at speeds of up to 140 miles an hour reducing journey times considerably. These Class 395 trains will also have a key role in the London 2012 Olympic Games transporting spectators. HSBC Rail (UK) Ltd owns approximately one third of the UK's rolling stock and provides a comprehensive range of rolling stock and management services for rail passenger and freight markets. It is a wholly-owned subsidiary of HSBC Bank plc, which is a wholly owned subsidiary of HSBC Holdings plc, headquartered in the UK and a member of the HSBC Group. Serving over 125 million customers worldwide, the HSBC Group has around 10,000 offices in 83 countries and territories in Europe, the Asia-Pacific region, the Americas, the Middle East and Africa. With assets of some US$2,150 billion at 30 June 2007, HSBC is one of the world's largest banking and financial services organisations. HSBC is marketed worldwide as 'the world's local bank'. The depco consortium is an unincorporated consortium of depot finance, design and construction specialists which delivers integrated, turnkey depot new builds as well as major depot redevelopments. The depco consortium for the new world class Ashford depot comprises HSBC Rail (UK) Ltd (structuring and funding), Fitzpatrick Contractors Ltd (construction - main contractor), RPS Burks Green (architectural, civil and structural engineering designers), EMCOR UK (mechanical and electrical and plant services), GrantRail (permanent way and overhead line contractor), Mace (interface and programme managers), and Norton Rose (legal advisors). © Hitachi, Ltd. 1994, 2007. All rights reserved.